This is my second writeup from PlaidCTF this past weekend! It's for the Web level called kpop, and is about how to shoot yourself in the foot by misusing serialization (download the files). There are at least three levels I either solved or worked on that involved serialization attacks (mtpox, reeekeeeeee, and this one), which is awesome because this is a seriously undersung attack. Good on the PPP! I'll start off with a quick summary of how vulnerable serialization happens, then will move onto specifics of this level. Generally, when an attacker provides code for a service to deserialize, it's frequently bad news. Basically, at best, it lets an attacker provide values to protected and possibly private fields. At worst, it allows an attacker to control function pointers or overloaded operators that can lead directly to code execution. In the case of PHP, you can't serialize functions, so it's harder to shoot yourself in the food. However, you can control private and protected fields, which is where this attack comes in. In retrospect, that was way overkill, but it was nice to get some fresh air. My goal was to find every variable in every class that got serialized, and to figure out every function in which it was used. 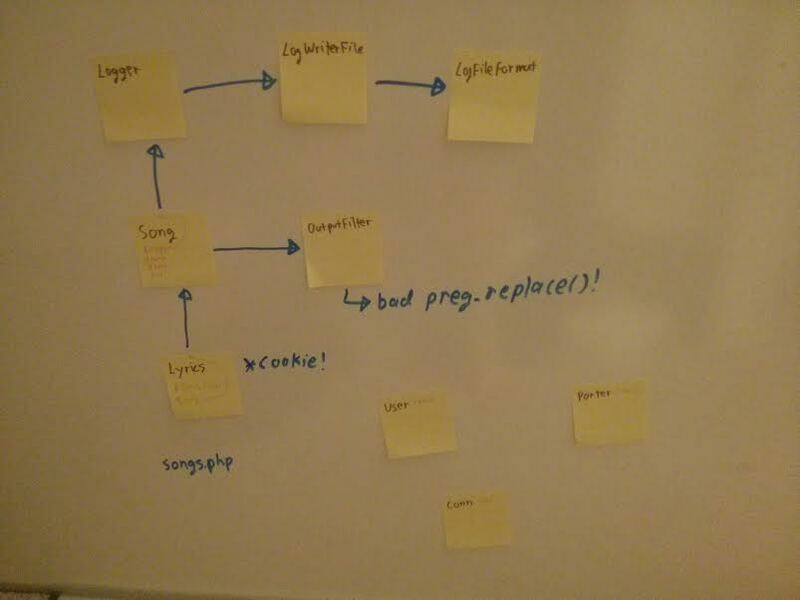 I knew that both the Lyrics class and lyrics strings got deserialized, one from a cookie and the other from a POST argument, and I also knew that Lyric contained references to a bunch of other classes (see the diagram). The /e modifier is deprecated. Use preg_replace_callback() instead. See the PREG_REPLACE_EVAL documentation for additional information about security risks. Warning This feature has been DEPRECATED as of PHP 5.5.0. Relying on this feature is highly discouraged. Beautiful, sounds like exactly what I want! Yup, our evil regular expression is there! Now we just set the 'lyrics' cookie to that (I like using the Web developer addon for firefox), visit http://54.234.123.205/import.php (note: the address won't work after a couple days), hit 'enter' in the field, and watch the money roll in! FYI. you didn't have to set the lyric cookie, you could have just put it into the import form. @slinkyman - I could be wrong, but I thought that only imported an array of strings? try it: http://54.234.123.205/import.php works for me. I tried it using the serialized payload above and it didn't work for me? I should clarify, that was supposed to be a reply to slinkyman -- I tried the import function without setting the cookie and it doesn't work. When using the cookie, it works as expected.